League of Gentlemen is a show I’ve heard mentioned here and there over the years, most notably a few back when the Kids in the Hall reunited to produce a miniseries that was said to be a weak xerox of it. 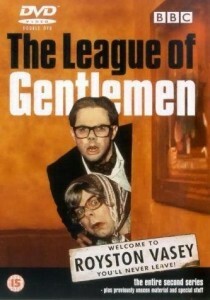 But that’s selling the Kids in the Hall short, as League of Gentlemen clearly owes much to their original work as well. “If Kids in the Hall made Twin Peaks” is how I’ve been pitching it to people after having made my way through half the series over the last few weeks. As much as it owes to Kids in the Hall (the limited male cast portraying a wide array of characters including cross-dressing for the women, the rapid fire nature of sketch comedy, the off-beat sense of humor) it owes equally to Twin Peaks, with its recurring cast of oddball characters populating a small town, the sagas and mysteries of which continuously spiral forward, often ending up in very dark places. The place where those two distinct flavors, humor and horror, clash is where the show draws much of its power, as you’re often left to wonder, as you’re watching something absolutely ghastly or downright viscerally terrifying unfold, “How is there a laugh track on top of this?” But the loose and dangerous structure of the show, in addition to being an ideal vehicle for the creators’ wild imaginations, showcases intricately structured, and unexpectedly emotionally intelligent, storytelling.